Model Down formed in the Spring of 2004. Sheridan and Nick played in a band called Effervescent (with Steph of Freeze Baby/The Deaf) from Saint Paul, MN, but that was years and years ago and they can’t believe anyone still remembers that group. Sheridan, Mike , and Nick probably would have been a band months and months before the Spring of 2004, but Mike was in Prague teaching English and those kinds of endeavors are important to the world at large. Mike came back to America and commuted between CT and MA before finally settling in Boston. A practice space was rented and slaying was commenced. 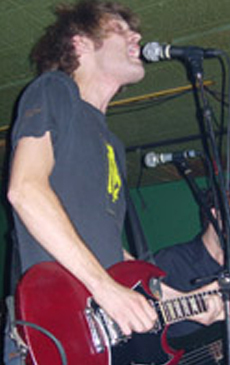 Model Down played their first show on April 16, 2004. At the end of August 2004, Model Down went into Dented Head studio to record their first EP. Seven songs were put to tape by Randy Rex and Matt Mirande, and mixed by Randy and the band. Six songs got the thumbs up and Jeff Lipton mastered the final product at Peerless Mastering. Modern Radio put the CDEP out in June of 2005. The band did a US tour shortly after releasing the EP. Sheridan finished college and moved back to Minnesota and formed His Mischief. He now plays guitar in Free Energy.